WP Lead Plus Free is a free plugin used to create landing pages with WordPress sites or blogs. You can create simple yet attractive pages, and can also add video. The free version is limited, but you are able to upgrade to the pro version for extra editing abilities. The plugin is unfortunately not incredibly easy to use, but there are a number of support videos you can watch to learn the ropes. Technical support itself has had mixed reviews so seems to be somewhat inconsistent. For a free plugin, WP Lead Plus Free is a great yet limited option. OptimizePress is another WordPress-based landing page builder that can be used as either a theme or plugin. It uses a drag-and-drop format and has some fantastic templates and elements to choose from. With no coding knowledge, you can create a stunning page very quickly. Growing to become one of the most popular landing page builders available, OptimizePress enables you to easily integrate your landing pages with shopping carts such as PayPal, 1SC and Google Checkout – a feature that many builders do not have. In comparison with Premise for WordPress, OptimizePress is a lot easier to use and manipulate – your experience with WordPress itself doesn’t need to be too much. 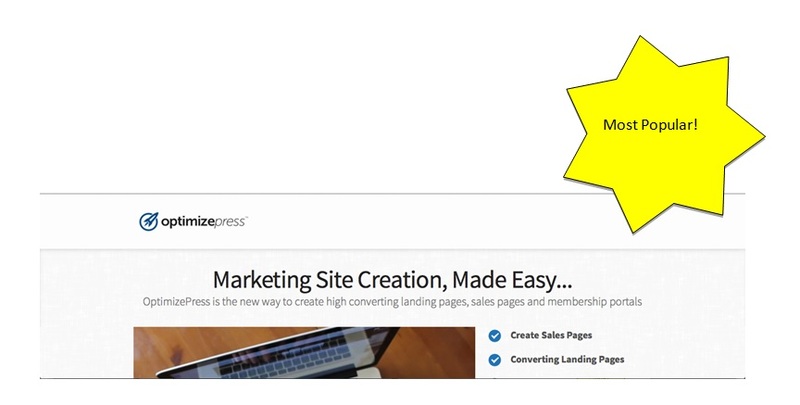 You can also use its included membership plugin to create a basic membership site. OptimizePress currently has had a number of bugs – especially with the 2.0 release. Nonetheless, they have an incredibly responsive support team and are constantly working on updates to fix the bits and pieces that don’t run so smoothly. There is no free trial available and Optimize Press is quite expensive with the basic package at $97, but this is a one-time fee and in the long run will work out as more economical – especially as many people have reported up to a 50% increase in sales after installing the plugin. Profits is a WordPress theme that you can upload to your blog or site and get started on your landing page right away. With this theme you can also create unlimited level membership sites, and it will automatically create disclaimer and privacy pages for you, which is a great time saver. Another drag-and-drop builder, Profits gives you a number of templates to choose from, although the current library only includes 6 different ones. The theme also has a certain number of extras that are typically needed as separate plugins with WordPress, such as opt-in forms and SEO. The support system is very consistent and most have reported an excellent response time from the developers. The Profits theme is a one-time payment purchase at $97 – a reasonable price for a successful landing page builder, especially as there are no monthly fees after the initial cost. Instabuilder is a WordPress Plugin that provides an easy to use platform to create your sales/landing pages. Made specifically for those not fluent in coding, Instabuilder utilizes a point and click format to allow you to create professional looking pages in minutes. Instabuilder has some great templates to choose from and some attractive elements to include in your pages. Some of the other key features include Facebook and Disqus comment integration, a range of stunning opt-in boxes, a viral content lock and one-time-offer options. There are a number of tutorial videos, but they are slow and difficult to follow and a lack of predefined headlines proves as a minus to some. You can buy a single license of Instabuilder for a one-time $47 payment, or an unlimited license for $77. WordPress Landing Pages is a free WordPress plugin for creating landing pages directly within your WordPress dashboard without having to change your theme. They offer a library of landing page designs, but you can also create your own custom design. One of the greatest features of WordPress Landing Pages is the ability to do A/B split testing easily within its own dashboard. You can clone any of your landing pages to create a split test and see the results in the plugin’s dashboard and on the page itself. Since this is a free plugin, there’s no guarantee that this will always be supported. However, it currently has an active support forum within wordpress.org and the developers seem to be updating the plugin regularly. WordPress Landing Pages also works hand-in-hand with WordPress Calls to Action and WordPress Leads so that you can create a full lead generation system for free.